I started with the English Dry White from Waitrose, which they kindly supplied, but usually costs £9.99. This was made for them at the famous Denbies Estate in Surrey. It was as classic an English still wine as you could ask for. Pale lemon/green colour, with big hits of lemon and lime citrus, granny smith apple, and uplifting elderflower. It wasn’t sickeningly pronounced either. On the taste it was dry, with plenty of refreshing acidity. A very good 14/20 from me, exactly what I was expecting! Next up was the New Hall Pinot Gris, from the People’s Republic of Essex! We picked this one up at the wine shop round the corner for £12.99. Pale lemon colour, and peach, apricot, honey, and orange blossom smells you tend to get from this grape. Only thing was that it wasn’t as pronounced as I’d have expected. If I’d have bought this for £12.99 as an Alsation Pinot Gris, I’d have been disappointed. There was nothing offensive about it, it was just a bit, I dunno, is flat the right word? A very acceptable, but not rushing back 12/20 from me. With the food, which ended up as a king prawn salad, there were mixed opinions. 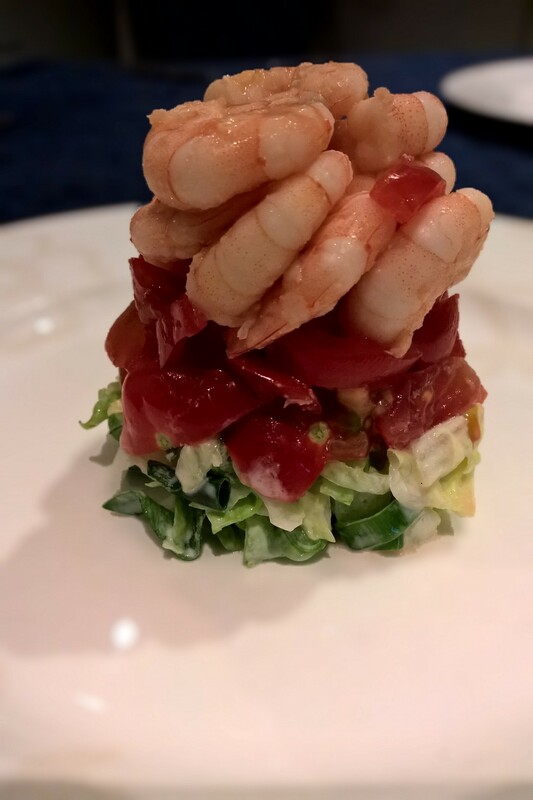 The minerality of the prawn meat and the lemon dressing in the lettuce went great with wine number one. The sweetness of the tomato mixed great with the off-dry style of wine number two. Effectively it was an attempted posh prawn cocktail, which seemed to go down very well indeed. English winemakers, and us wine geeks, have a lot to be excited about! #NWTW 56 – E is for England! #NWTW 56 – Does English Wine Have An Image Problem In Britain? #NWTW 56 – Isn’t it Too Cold to Grow Grapes in England? 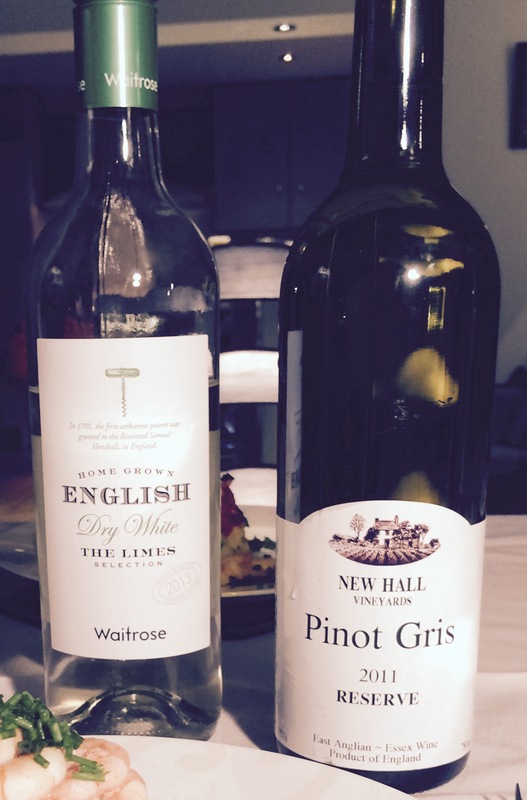 #NWTW 56 – What to Eat With English Still Wine? This sounds like a particularly good wine/food to experiment with in the summer! Unfortunately no English wine here in Ontario. Probably similar to the availability of Canadian wine there. But, I am in the UK from time to time and will seek out some. do so boss! All we get here really is Canadian IceWine, gap in the market for you to exploit? We drink more white wine than we used to. I don’t enjoy a “flat” wine however. The prawn looks delicious. Being from the middle of the US, we don’t get a lot of fresh sea food. You must get some fresh water fish, no? Most of our fish are “fresh frozen”. There isn’t large enough bodies of water for commercial fishing here and we ares o far from the coasts that it wouldn’t be too fresh by time it got here. When we vacation we eat lots of fresh fish. ← #NWTW 56 – What to Eat With English Still Wine?